This guidance applies only to cities, counties and transportation benefit districts. 3.11.1.10 Transportation Benefit Districts (TBDs) are separate legal entities that are created by cities or counties under Chapter 36.73 RCW for the purpose of financing their transportation improvements. The governing body of the creating city/county serves also as the governing body of the district and the district’s area of operation is limited to the boundaries of the creating city/county. 3.11.1.20 Any transportation improvement funded by the district must be owned by either the creating city or county or by the State or a participating port or transit district. Transportation improvement projects may also include the operation, preservation, and maintenance of facilities, so not all spending must result in an asset. 3.11.1.30 Generally, a TBDs only activity is to collect a non-voted car tab fee or a voter-approved sales tax and to remit the proceeds to the creating city/county. However, under Chapter 36.73 RCW, TBDs may also collect voter-approved property taxes, impact fees and tolls. Districts may also issue bonds, accept grants and donations, and create LIDs. 3.11.1.40 Per RCW 36.73.050, the ordinance that establishes the district must specify the functions and transportation improvements to be funded by the district. Some ordinances establishing TBDs identify projects with a definitive completion date and restrict allowable expenditures to specific costs; however, most ordinances provide for ongoing projects and any spending allowable for a street or road fund. The MRSC website has an expanded discussion of the history of TBDs and a list of active districts. 3.11.1.50 Each TBD should have its own MCAG number, submit its own annual report, and is subject to a separate audit in accordance with Chapter 43.09 RCW. Per RCW 36.73.020(3), districts must use the creating city or county as their fiscal agent. Accordingly, the TBD should be accounted for in the city/county’s general ledger and its transactions should be processed through the city/county’s regular bank accounts and systems. There is no requirement for the city/county to open a separate bank account for the TBD. Typically, all TBD revenues are immediately disbursed to the creating city/county as contract expenditure. Under this typical model the TBDs would not have any direct expenditures or hold any cash or assets. The TBD’s revenues should be accounted for as BARS code 3176000 for car tab fees and 3132100 for sales tax. If the TBD disburses these revenues to the city/county, it should record the payment as contract expenditure (54PPP50). The city/county would then record 3441000 for receipt of the contract revenues and record actual expenditures using appropriate expenditure codes (54PPPP0, 595PPP0, etc.). If the TBD expends funds directly, it would record expenditures using appropriate expenditure codes for the transaction. The city/county should ensure that there is no double counting of the same expenditures in the city/county and TBD’s accounting system. Furthermore, the city/county’s capital assets value should be adjusted to reflect improvements accounted for directly in the TBD. 3.11.1.80 Cash basis cities/counties. The TBD should be reported in the city/county’s annual report as a fiduciary fund. Also, the city/county as a treasurer should prepare a separate annual report for the TBD since the TBD is a separate legal entity. From the TBD’s perspective, it reports as a general fund and the fund number should be 001. 3.11.1.90 GAAP cities/counties. For reporting purposes, TBDs are considered blended component units. This relationship should be disclosed in the notes to financial statements. Generally, the TBD is blended into the city/county fund that receives and spends the tax revenues (e.g., general fund, street fund, etc.). 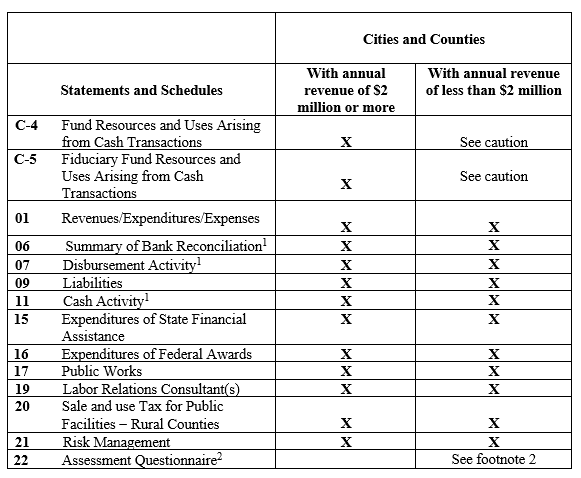 Blending into the city/county fund that receives and spends the TBD’s revenues results in an intra-fund elimination to avoid double counting and reporting. 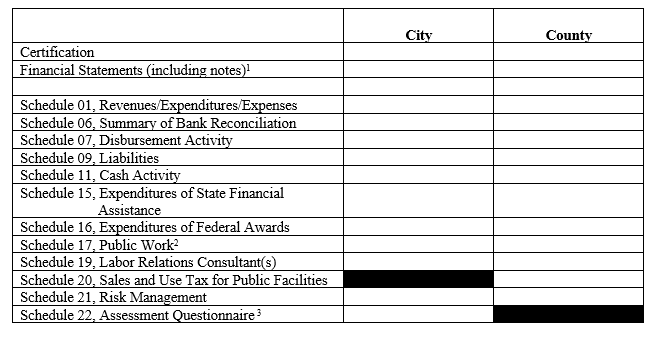 The city/county should also report actual expenditures related to performed work (54PPPP0, 595PPP0, etc.). However, the city/county may choose to blend the TBD by reporting it as a separate special revenue fund of the city/county, in which case eliminations would only be made for the government-wide statements. 3.11.1.100 Also, the city/county as a treasurer should prepare a separate annual report for the TBD since the TBD is a separate legal entity. From the TBD’s perspective, it reports as a general fund and the fund number should be 001. General compliance requirements apply to TBD’s, including the Open Public Meetings Act, public disclosure, expenditure audit and certification, conflict of interest, insurance/bonding requirements, limitation of indebtedness and authorized investments. RCW 36.73.160(2) requires the district to issue an annual report describing the status of transportation improvements, expenditures, revenues and construction schedules. This requirement is separate from, and in addition to, the BARS annual reporting requirements of RCW 43.09.230. Chapter 36.74 RCW authorizes cities and counties assumption of existing TBDs. 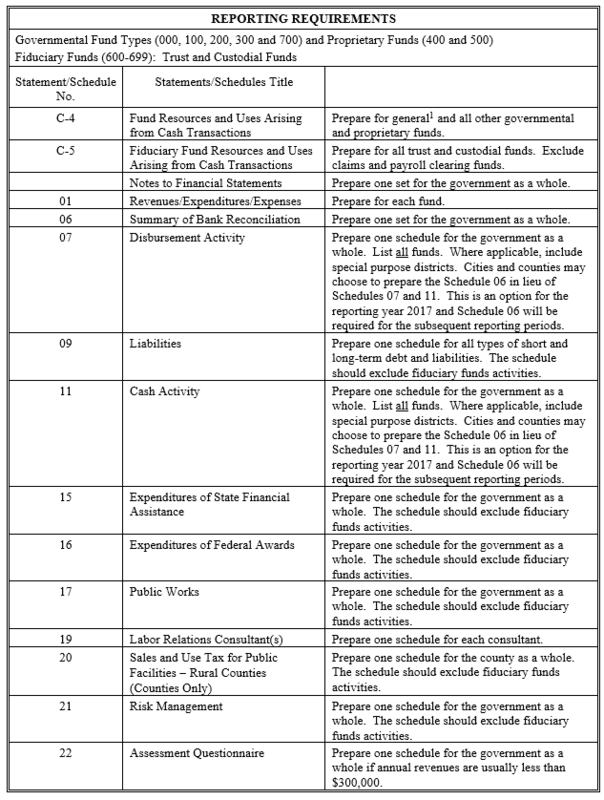 When the TBD ceases to exist as a separate legal entity, the district is still require to prepare the final annual report (financial statements and appropriate schedules) for the last (entire or partial) year of its existence. The district will be also subject to close-out audit. 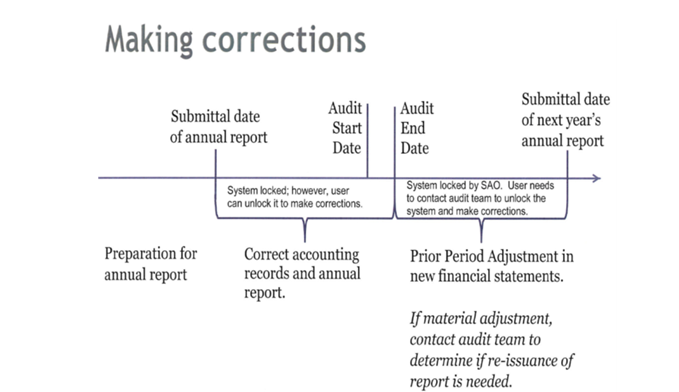 The assumption of TBDs by cities and counties require reporting to the State Auditor’s Office through the New Entity Creation or Dissolution Notification form. This form should be submitted electronically to your local audit team. GAAP governments should treat this transaction as a transfer of operations described in GASB Statement 69, Governments Combinations and Disposals of Governments Operations. In both GAAP and cash basis entities, the final entry should be coded to account 3850000, Special/Extraordinary Items. This account should be used in both situations: (1) in the TBD (negative) when disposing the operations, and (2) in the city/county (positive) when receiving the money. It should not be coded as street expenditure in the TBD.